This article is about the prophet. For the son of Javan mentioned in Genesis 10, see Elishah. For others with the same given name, see Elisha (given name). Not to be confused with Elijah. Elisha (/ɪˈlaɪʃə/; Hebrew: אֱלִישָׁע, Modern: ʼElišaʻ, Tiberian: ʼĔlîšāʻ, "My God is salvation", Greek: Ἐλισ[σ]αῖος, Elis[s]aîos or Ἐλισαιέ, Elisaié) was, according to the Hebrew Bible, a prophet and a wonder-worker. Also mentioned in the New Testament and the Quran, Elisha is venerated as a prophet in Judaism, Christianity, and Islam. Amongst new religious movements, Bahá'í writings refer to him by name. His name is commonly transliterated into English as Elisha via Hebrew, Eliseus via Greek and Latin, or Alyasa via Arabic, and Elyesa via Turkish. He is said to have been a disciple and protégé of Elijah, and after Elijah was taken up in a chariot of fire, accepted as the leader of the sons of the prophets. Russian icon of Elisha (18th century, Kizhi Monastery, Russia). Elisha's story is related in the Book of Kings in the Hebrew Bible (in Judaism, part of the Nevi'im). According to this story, he was a prophet and a wonder-worker of the Northern Kingdom of Israel who was active during the reign of Joram, Jehu, Jehoahaz, and Jehoash (Joash). Elisha was the son of Shaphat, a wealthy land-owner of Abel-meholah; he became the attendant and disciple of Elijah. His name first occurs in the command given to Elijah to anoint him as his successor. After learning in the cave on Mount Horeb, that Elisha, the son of Shaphat, had been selected by Yahweh as his successor in the prophetic office, Elijah set out to find him. On his way from Sinai to Damascus, Elijah found Elisha "one of them that were ploughing with twelve yoke of oxen". Elisha delayed only long enough to kill the yoke of oxen, whose flesh he boiled with the wood of his plough. Elijah went over to him, threw his mantle over Elisha's shoulders, and at once adopted him as a son, investing him with the prophetic office. Elisha accepted this call about four years before the death of Israel's King Ahab. For the next seven or eight years Elisha became Elijah's close attendant until Elijah was taken up into heaven. During all these years we hear nothing of Elisha except in connection with the closing scenes of Elijah's life. After he had shared this farewell repast with his father, mother, and friends, the newly chosen prophet "went after Elijah, and ministered unto him." He went with his master from Gilgal to Bethel, to Jericho, and thence to the eastern side of the Jordan, the waters of which, touched by the mantle, divided, so as to permit both to pass over on dry ground. Elisha then was separated from Elijah by a fiery chariot, and Elijah was taken up by a whirlwind into Heaven. Before Elijah was taken up into the whirlwind, Elisha asked to "inherit a double-portion" of Elijah's spirit. Some scholars see this as indicative of the property inheritance customs of the time, where the oldest son received twice as much of the father's inheritance as each of the younger sons. In this interpretation Elisha is asking that he may be seen as the "rightful heir" and successor to Elijah. Critics of this view point out that Elisha was already appointed as Elijah's successor earlier in the narrative and that Elisha is described as performing twice as many miracles as Elijah. In this interpretation the "double-portion" isn't merely an allusion to primacy in succession, but is instead a request for greater prophetic power even than Elijah. Much of this confusion comes from translations which incorrectly translate the phrase as a "double portion" while in Hebrew Elisha asks for "two thirds of a portion" of the prophetic spirit that imbued Elijah. By means of the mantle let fall from Elijah, Elisha miraculously recrossed the Jordan, and Elisha returned to Jericho, where he won the gratitude of the people by purifying the unwholesome waters of their spring and making them drinkable. 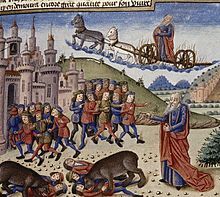 The bears savaging the youths at Elisha's command, while Elijah is borne in the flying chariot (1453 French manuscript). Before he settled in Samaria, Elisha passed some time on Mount Carmel. 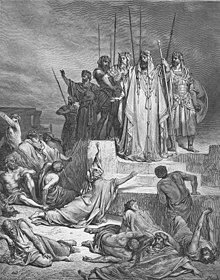 When the armies of Judah, Israel and Edom, then allied against Mesha, the Moabite king, were being tortured by drought in the Idumean desert, Elisha consented to intervene. His double prediction regarding relief from drought and victory over the Moabites was fulfilled on the following morning. When a group of boys (or youths) from Bethel taunted the prophet for his baldness, Elisha cursed them in the name of Yahweh and two female bears came out of the forest and tore forty-two of the boys. He became noted in Israel, and for six decades (892–832 BC) held the office of "prophet in Israel". He is called a patriot because of his help to soldiers and kings. Elisha cleansed the infected waters of Jericho which were considered to be a cause of miscarriages and fatalities. To relieve a prophet's widow importuned by a harsh creditor, Elisha so multiplied a little oil as to enable her, not only to pay her debt, but to provide for her family needs. There is a Jewish tradition, or legend, that the woman's husband was Obadiah, the servant of King Ahab, who hid 100 prophets in two caves. To reward the rich lady of Shunem for her hospitality, he obtained for her from Yahweh, at first the birth of a son, and subsequently the resurrection of her child, who had died. To nourish the sons of the prophets pressed by famine, Elisha changed a pottage made from poisonous gourds into wholesome food. He fed a hundred men with twenty loaves of new barley, leaving some left over, in a story which is comparable with the miracles of Jesus in the New Testament. The Cambridge Bible for Schools and Colleges notes that the focus of this narrative does not dwell "on the increase of the bread by a miracle, and we are left to accept the result as either brought about in that way, or by the appetites of the men being satisfied with a small quantity." Elisha cured the Syrian military commander Naaman of leprosy but punished his own servant Gehazi, who took money from Naaman. Naaman, at first reluctant, obeyed Elisha, and washed seven times in the River Jordan. Finding his flesh "restored like the flesh of a little child", the general was so impressed by this evidence of God's power, and by the disinterestedness of His Prophet, as to express his deep conviction that "there is no other God in all the earth, but only in Israel." Elisha allowed Naaman to continue in the service of the Syrian king and therefore be present in the worship of Rimmon in the Syrian temple. In the Christian tradition, Jesus referred to Naaman's healing when he said, "And there were many lepers in Israel in the time of Elisha the prophet: and none of them was cleansed but Naaman the Syrian." Elisha's public political actions included repeatedly saving King Jehoram of Israel from the ambushes planned by Benhadad, ordering the elders to shut the door against the messenger of Israel's ungrateful king, bewildering with a strange blindness the soldiers of the Syrian king, making iron float to relieve from embarrassment a son of a prophet, confidently predicting the sudden flight of the enemy and the consequent cessation of the famine, and unmasking the treachery of Hazael. Other miracles Elisha accomplishes include the recovery of an axe fallen into the waters of the Jordan. He administered the miracle at Dothan, half-way on the road between Samaria and Jezreel. At the siege of Samaria by the king of Syria, Elisha prophesied about the terrible sufferings of the people of Samaria and their eventual relief. Elisha then journeyed to Damascus and prophesied that Hazael would be king over Syria. 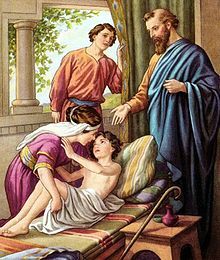 Mindful of the order given to Elijah, he directs one of the sons of the prophets to anoint Jehu, the son of Jehoshaphat, as king of Israel, and commissions him to cut off the house of Ahab. 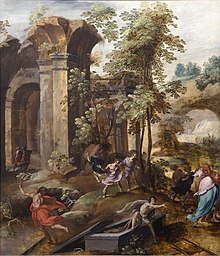 The death of Jehoram, pierced by an arrow from Jehu's bow, the ignominious end of Jezebel, the slaughter of Ahab's seventy sons, proved how faithfully executed was the Divine command. After predicting to Jehoash his victory over the Syrians at Aphek, as well as three other subsequent victories, ever bold before kings, ever kindly towards the lowly, "Elisha died, and they buried him." The arrow of the Lord’s deliverance and the arrow of deliverance from Syria; for you must strike the Syrians at Aphek till you have destroyed them. Elisha predicts three successful battles over the Arameans, but no absolute victory. 2 Kings 13:25 records three victories of Joash whereby cities lost to the Arameans, probably on the west bank of the Jordan, were regained. The touch of his corpse later served to resuscitate a dead man. A year after Elisha's death and burial (or, in the following spring) a body was placed in his grave. As soon as the body touched Elisha's remains the man "revived, and stood up on his feet". He is venerated as a saint in a number of Christian Churches. His feast day is on June 14, on the Eastern Orthodox, and Eastern Catholic liturgical calendars (for those churches which use the traditional Julian calendar, June 14 falls on June 27 of the modern Gregorian calendar). John of Damascus composed a canon in honor of Elisha, and a church was built at Constantinople in his honor. In Western Christianity he is commemorated in the calendar of saints of the Carmelites, a Catholic religious order, following a decree of the Carmelite General Chapter of 1399. He is also commemorated as a prophet in the Calendar of Saints of the Lutheran Church–Missouri Synod. Both calendars also celebrate him on June 14. Both the Orthodox and Roman Catholics believe that he was unmarried and celibate. Julian the Apostate (361–363) gave orders to burn the relics of the prophets Elisha, Obadiah and John the Baptist, who were buried next to each other in Sebastia, but they were rescued by the Christians, and part of them were transferred to Alexandria. Today, the relics of Elisha are claimed to be among the possessions of the Coptic Orthodox Monastery of Saint Macarius the Great in Scetes, Egypt. Listed by Islamic name and Biblical name. Elisha (Arabic: اليسع‎, Al-Yasaʿ) is venerated as a prophet in all of Islam, and is also honored by Muslims as the prophetic successor to Elijah (Arabic: Ilyās = Greek: Elias). Elisha is mentioned twice in the Quran as a prophet, and is mentioned both times alongside fellow prophets. According to the Quran, Elisha is exalted "above the rest of creation" (Arabic: فَضَّلْنَا عَلَى ٱلْعَالَمِين faḍḍalnā ʿalā l-ʿālamīna) and is "among the excellent" (Arabic: مِنَ ٱلْأَخْيَار mina ’l- akhyāri). Although the Quran does not give any details about Elisha's life, later Muslim tradition fleshed out Elisha's narrative through consulting the Hebrew Bible. Sources that identify Elisha with al-Khidr cite the strong relationship between al-Khidr and Elijah in Islamic tradition. Some Muslims believe the tomb of Elisha is in Al-Awjam in the eastern region of Saudi Arabia. The shrine was removed by the Saudi Government because such veneration is not in accordance with the Wahhabi or Salafi reform movement dominant in Saudi Arabia. It had been an important landmark for many centuries during and before the Sunni Ottoman rule of the Middle-East, and had been a very popular pilgrimage destination for Muslims of all sects throughout the pre-modern period. A shrine of Elisha is also present in the Eğil district of Diyarbakir Province, Turkey. ^ Wells, John C. (1990). "Elisha". Longman Pronunciation Dictionary. Harlow, England: Longman. p. 239. ISBN 0-582-05383-8. ^ Revisioning the Sacred: New Perspectives on a Bahái̓́ Theology, Volume 8. p. 32. Jack McLean. 1997. ^ a b Achtemeijer, Paul L. ed., and Dennis R. Bratcher, Ph.D. "Elisha." HaperCollins' Bible Dictionary. New York, New York: HarperCollins Publishers, 1996. ^ a b c ""Elisha", Jewish Encyclopedia". ^ Dothie, William Plaskett; ), Elisha (the Prophet (1872). Dothie, William Plaskett. The history of the prophet Elisha. ^ "Wald, Jack, "Asking for a double share", Rabat International Church, November 2, 2003". ^ Francis, Rodney W. "The Prophetic Double Anointing". The Gospel Faith Messenger. gospel.org.nz. ^ a b c d ""Eliseus", the Order of Carmelites". ^ a b c Duffy, Daniel (1909). "Eliseus". The Catholic Encyclopedia. 5. New York: Robert Appleton Company. Retrieved 7 January 2014. ^ Hebrew na'ar, translated "youths" in the New International Version. Jewish Encyclopedia on Elisha states, "The offenders were not children, but were called so ("ne'arim") because they lacked ("meno'arin") all religion (Soṭah 46b)." Although the Authorized King James Version used the words "little children", theologian John Gill stated in his Exposition of the Bible that the word was "used of persons of thirty or forty years of age". ^ a b ""Elisha"". Orthodox Church in America. ^ Rev. Paul L. Rothermel (2010-08-19). "Jesus was never married". Answers In-Depth to Questions about Christianity. St. Ignatius reading. Archived from the original on 2011-07-28. ^ Denys Pringle, The Churches of the Crusader Kingdom of Jerusalem: A Corpus. Vol. 2: LZ (excluding Tyre), p. 283. ^ "The Monastery of St. Macarius the Great". ^ Tottoli, Roberto, “Elisha”, in: Encyclopaedia of the Qurʾān, General Editor: Jane Dammen McAuliffe, Georgetown University, Washington DC. Brill Online. ^ Tottoli, Roberto, “Elisha”, in: Encyclopaedia of Islam, THREE, Edited by: Kate Fleet, Gudrun Krämer, Denis Matringe, John Nawas, Everett Rowson. Brill Online. ^ "Religious curbs in Saudi Arabia – Report: JAFARIYA NEWS, December 12 News". ^ "Salafi Bidah in respecting the signs of Allah". ^ "Diyarbakır - Eğil - Peygamberler Türbesi". This article incorporates text from a publication now in the public domain: Herbermann, Charles, ed. (1913). "Elisha" . Catholic Encyclopedia. New York: Robert Appleton. al-Thaʿlabī, Qiṣaṣ al-anbiyāʾ (Cairo 1954), 259–61, trans. William M. Brinner, ʿArāʾis al-Majālis fī Qiṣaṣ al-Anbiyāʾ or Lives of the prophets, as recounted by Abū Isḥāq Aḥmad ibn Muḥammad ibn Ibrāhīm al-Thaʿlabī (Leiden 2002), 432–35. Wikimedia Commons has media related to Eliseus. Wikisource has the text of the 1905 New International Encyclopedia article Elisha. Wikisource has the text of the 1897 Easton's Bible Dictionary article Elisha. Italics indicate persons whose status as prophets is not universally accepted. Note: Muslims believe that there were many prophets sent by God to mankind. The Islamic prophets above are only the ones mentioned by name in the Quran.